Head roaster and green coffee buyer Carl (pictured far right) recently had the opportunity to attend the Mejor de Huila auction in Colombia. 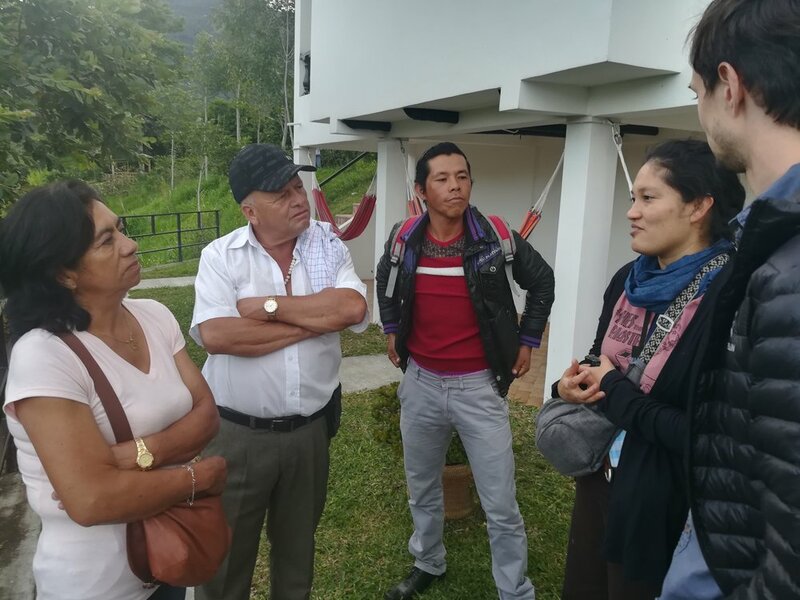 He was able to meet with producers from all over this picturesque region and was invited to visit many of their farms where he was thoroughly impressed and inspired. These producers are extremely dedication to the sustainability and quality of their coffees... and it shows. After long hours sitting in auction, he managed to snag a beautiful coffee produced by Marco Antonio Romero to share with you. Luckily, he knew what he wanted going into the auction, so despite it being 3am, he had his head on straight and his eyes on the prize. This delightfully smooth coffee was produced by Marco Antonio Romero in San Agustin, Huila. We really think you are going to like the citrus notes you get up front, and the deliciously smooth milk chocolate finish. Limited supply, so get your bag now!